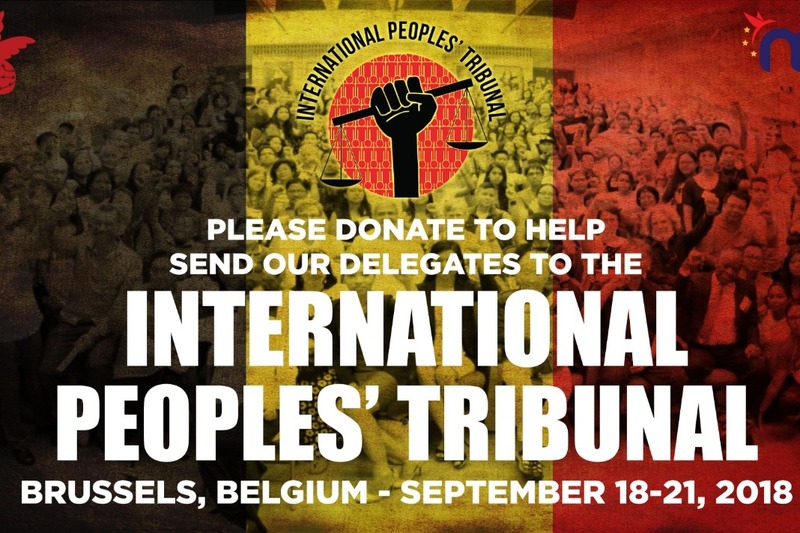 Please consider making a donation to help fund the cost of the International People's Tribunal and allow us to bring a US-based delegation from ICHRP-US and the Malaya Movement! For updates and to learn about other ways you can support, please follow us on the ICHRP-US Facebook Page and the Malaya Movement Facebook Page . For feedback and inquiries, please send us an email at ichrpus@gmail.com. The 16th President of the Philippines, President Rodrigo Roa Duterte, rode on the Filipino people’s clamor for change in his electoral campaign and in the first few months of his presidency. He promised pro-people economic reforms, opened his Cabinet to progressive leaders from civil society, resumed the long-stalled peace talks with the revolutionary National Democratic Front of the Philippines (NDFP), and called for an independent foreign policy, to name a few. But less than two years into his term, his human rights record has surpassed the records of previous administrations (Arroyo and the recent Aquino regimes’), even that of the notorious Marcos dictatorship. He has not only continued their anti-people economic programs, he waged a brutal “war on drugs”, declared and sustained martial law in Mindanao, unilaterally cancelled the peace talks with the NDFP and instead declared an “all-out-war” and intensified its US-inspired counterinsurgency program Oplan Kapayapaan, intentionally targeting unarmed activists and human rights defenders. Philippine human rights group KARAPATAN (Alliance for the Advancement of People’s Rights), has documented 126 extrajudicial killings (EJKs), 235 frustrated EJKs, 272 illegal arrests and detention, 930 illegal arrest without detention, 426,590 victims of forced evacuation, 39,623 cases of use of public places for military purposes, 362,355 incidents of indiscriminate firing from July 2016 to December 2017. These figures do not even include the unprecedented number of killings as a result of the administration’s anti-drug war Tokhang now estimated to be at least 10,000. While Philippine National Police (PNP) spokesperson Chief Superintendent Dionardo Carlos denies that there are extrajudicial killings under the Duterte administration,the PNP reported that there had been 6,225 drug-related deaths between July 2016 and September 2017.Furthermore, the PNP released a report that as of April 23, 2017, 7,080 people had been reported as killed in the “War On Drugs” since July 1, 2016. The victims of this bloody campaign are largely poor people, including minors and youth. Well-documented cases of these human rights violations have been brought to the attention of the United Nations Human Rights Council (UNHRC) by several concerned Philippines based as well as international civil society organizations through the Universal Periodic Review on the Philippines (UPR) process in Geneva in 2017 and the Special Procedure mechanisms. A number of national and international entities have likewise conducted fact-finding solidarity missions and have issued reports, recommendations and condemnations of the Philippine government’s inaction to stop the killings and other serious human rights violations in the country. Despite the conclusions of these entities confirming the responsibility and culpability of State authorities, President Duterte and his closest allies remain unmoved and are intent in continuing atrocities, emboldened by US political and military backing. Victims of human rights violations under the US-Duterte regime are seeking justice. They have organized themselves and are working closely with various organizations in strengthening efforts to hold perpetrators to account. It is at their behest that the IPT 2018 is being convened by the European Association of Lawyers for Democracy and World Human Rights (ELDH), Haldane Society of Socialist Lawyers, International Association of Democratic Lawyers (IADL), IBON International, and the International Coalition for Human Rights in the Philippines (ICHRP). The IPT 2018 shall seek to help raise the visibility before the international public of the ongoing violation of peoples’ rights in the Philippines, exercise moral suasion, and help generate further political pressure on the governments of the Philippines and the US to heed the calls of the Filipino people. The IPT is a court of public opinion where concrete evidence shall be presented (through survivors and expert witnesses) of their violations of the Filipino people’s individual and collective rights under international law. They will be brought for judgment before the broadest possible international audience. Let us be reminded that the resulting international uproar against the spate of extra-judicial killings under the US-Arroyo regime soon after the Permanent Peoples’ Tribunal Second Session in the Philippines (Gloria Macapagal Arroyo and George W. Bush), contributed to a decrease in the incidence of such killings in the latter part of 2007. The decline, though temporary, was a welcome respite for the Filipino people under siege. The Filipino people again appeal to the peoples of the world to listen to their voices and join them in their struggle for just and lasting peace in the land. We invite you to heed their call and be a part of the IPT 2018 in Brussels, Belgium, from September 17 to 21, 2018. We fervently hope that you can attend the actual Tribunal in September 2018.